I most love to go out the Botanical Garden early in the morning. The light is special and filled with moisture. As time passes and that is really the reason I like working on a project like this, you get to watch as the garden transitions from one season to the next. This painting came from a overcast day that eventually gave in to rain in the afternoon. It has taken me along time to realize that life is really about transition and how we deal with change. A constant lesson in impermanence. I believe that is what painting nature teaches us. Change is the only constant. Back in April in 2014 shortly after I began my nature native project with a series of paintings of plants native to Georgia I came across these small Volet volunteers growing in the shade at the edge of my back yard. Today I found these smiling like old friends you haven’t seen in a long time. You have to be looking to find these little beauties and when you do it is a moment to celebrate. I plan to work some paintings of the Violets in charcoal and acrylic but today I just wanted to share the excitement of spring! 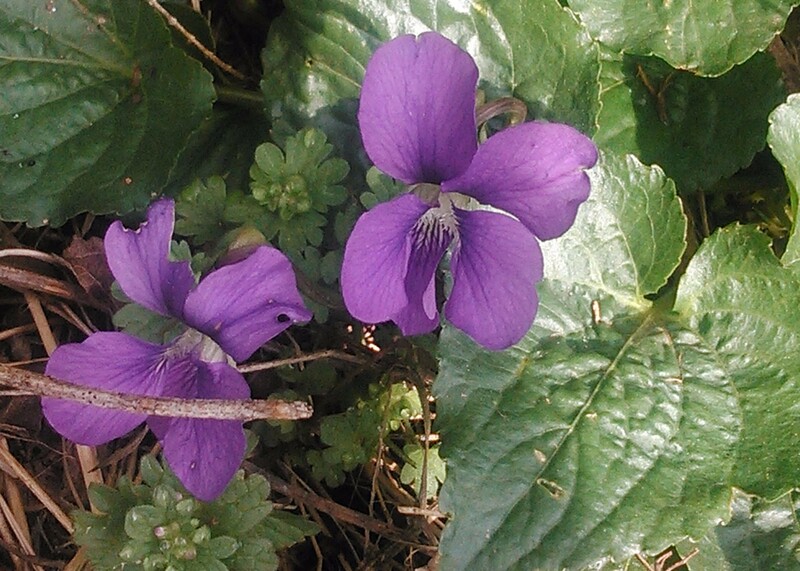 I posted the first watercolor in Birdsfoot Violet…Viola pedata on April 9, 2014. The second painting I posted in Birdsfoot Violet…Viola pedata var. alba on April 12, 2014. I wanted to continue with painting the ice storm. Sometimes an image just so much fun or just so compelling it takes hold of you and there’s a desire to create more paintings; create better paintings; make paintings and drawings in different formats; different media. That leads me to this piece and working again in acrylic. You want to pull it all together and allow the ideas flow onto a new surface. Just enjoy the process and ride along until the wheels come off. I’ve painted the field out behind my house many times and the first one to be part of nature native in early September 2014 is out my backdoor 01 and there’s a freedom and joy to it that I wanted to carry into this new vision of the ice storm. Most recently, of course is ice storm 03 …looking out my backdoor. I like the color and use of color in this one So somewhere between the two lies the latest. Working in acrylics on canvas is requires a different mindset from working in watercolor on paper. Perhaps there is no more obvious fact but it is something I have to remind myself as I paint. I used a different palette for this painting based on the acrylics I have on hand: Ultramarine Blue, Brilliant Blue, Dioxazine Purple, Bright Aqua Green, Chrome Oxide Green, Yellow Ochre, Burnt Sienna, White and Black. To be honest one of the reasons I wanted to work this new painting up in acrylic is I have several stretched canvases about and some acrylic paintings that need to be whited out and reused. I firmly believe that work, consistent, sustained quality effort is the key to progress and success. I wanted to capture this years first and hopefully only ice storm. Unfortunately the forecast does not bode well for that, maybe we’ll get snow instead of ice. When nature offers you a great feast for your eyes you just have to foolish not to take advantage of the opportunity. Especially if the opportunity is pretty rare. Here in Athens, Georgia we get about one ice storm and/or a snow a year in late winter. Even though I have begun to use my larger palette with more colors available for use I still like to limit the number of colors I use based on the needs for a specific painting. Just because you can doesn’t mean you should. For this painting I used Cerulean Blue, Bismuth Yellow, Mineral Violet, Ultramarine Blue, Olive Green and Burnt Sienna.